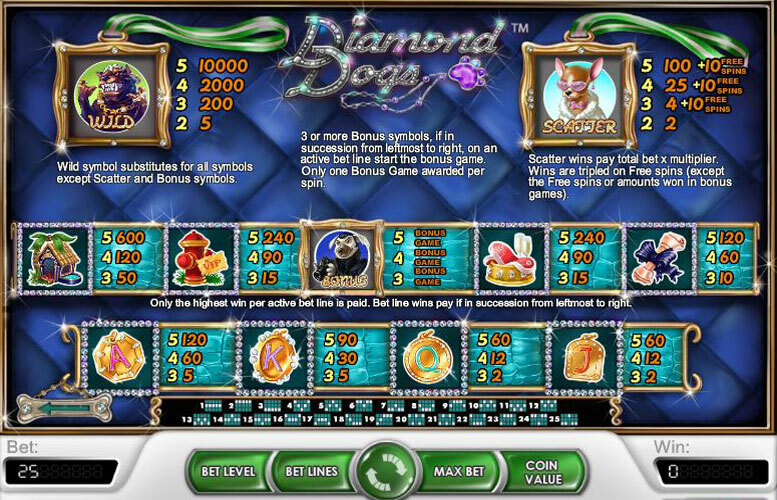 Diamond Dogs offers glitz, glamour and the chance to net yourself 40,000 coins in any single spin. You can trigger free spins and a bonus feature which allows you to choose dogs from the red carpet to reveal big payouts! Take it for a spin, you’ll love it. Music lovers may be a little disappointed to find out that this five reel, 25 payline slot machine is not themed after the David Bowie album of the same name, but for those who adore man’s best friend, this is the perfect game to play. This game features glamorous dogs wearing gold jewelry and acting like celebrities for the Red Carpet Photo Shoot bonus feature. This game has three special symbols, a wild, a scatter that awards free spins, and the bonus symbols. The highest payout is 10,000 coins, well within the realms of decent payouts for playing a slot machine online. Players can hear a dog bark every time they click the spin button and the special symbols have animations that activate when they appear in the right combinations. To win the top jackpot of 40,000 coins, players must place the maximum bet of four and spin five of the wilds on an active payline. This would pay 10,000 at the first bet level but 40,000 at the highest. The wilds actually have the next highest payout with 2,000 coins for spinning four of them in a row. The bonus game can also lead to some huge payouts, as long as players are lucky enough not to take a blurry picture too early in the photo shoot. This game has 25 paylines that players can bet on up to four times each. The coins values range from 0.01 to 0.50 coins. Depending on how players bet, this can make for a total bet of £50 per spin full coins. 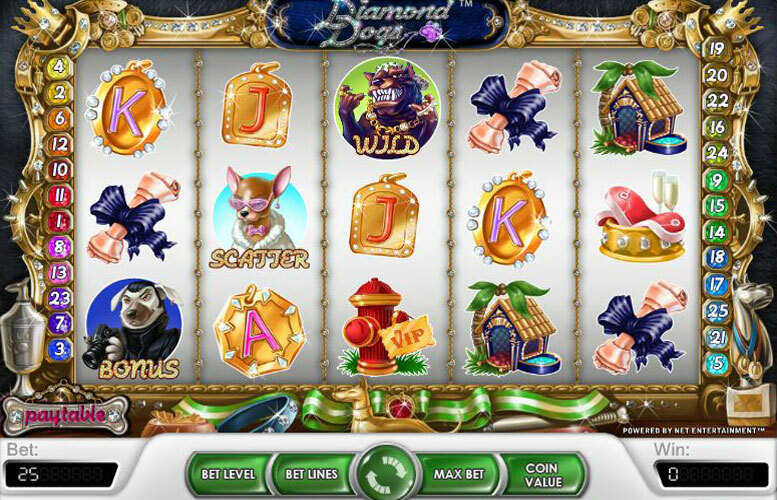 To obtain the maximum payouts, players must use the maximum bet level. J and Q: These are the lowest paying icons in the game and they pay out with equal values. Three matching will pay players a measly 2 coins. Four will pay 12 coins and five pay 60 coins. K: Getting five of these in a row will award players 90 coins and four will pay 30 coins. Three on an active payline will grant players a win of 5 coins. A and Bone: The last of the letters and the first of the picture symbols also pay out in equal values. For spinning three, players will be rewarded with 10 coins. Four in a row will pay 60 coins and five award the most at 120 coins. Steak and Fire Hydrant: If players look close enough, they will notice glasses of champagne just behind the food bowl full of steaks. The steaks and the fire hydrant will award players with equal payouts for combinations of three or more. These will pay 240 coins for getting five of them, as long as they are matching since they will not substitute for one another, on an active payline that spans the reels. Four pays 90 coins and three pay the least with only 15 coins. Dog House: This dog house has a palm tree just outside the door, lending a somewhat tropical feel to the game. The dog house will award 600 coins for five in a row and 120 coins for spinning four of them in a winning combination. Three dog houses award 50 coins to players. Wild: Depicted as some large breed of dog draped in gold chains and wearing a toothy smile, this pays out the most with 10,000 coins for a combination of five on a payline. Four awards the second highest payout of 2,000 coins. Players are awarded 200 coins or 50 coins for getting three or two in a row. As a wild, this symbol will help complete all other combinations, except for the scatters or the bonus. Scatter: This little Chihuahua with pink sunglasses is the scatter of the game and for getting three or more of them anywhere one the reels, players will be rewarded with 10 free spins. She will also award players with a multiplier that is applied to the total stake for 2 or more appearing; two doubles the total bet, three will quadruple the total bet, four applies a 25x multiplier and five awards 100 times the line bet. Winnings during the free spins are tripled and more free spins can be won during the feature. Bonus Symbol: Spinning three or more of these suave looking dogs that hold cameras will activate the Red Carpet Photo Shot. Players are faced with 12 dogs, nine of which hide bonuses while the others will result in blurry photos that will end the feature. Simply click on the dogs one at a time until either all the bonuses are found or a blurry photo comes up. This game has a rating of 2 / 5 with 114 total reviews by the users.